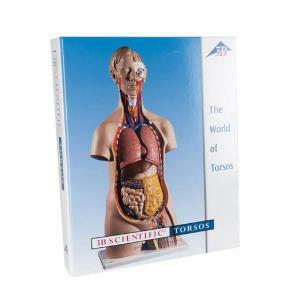 The 3B Scientific® Torso-Guide is available without a torso so each teacher can have his/her own private 1st hand copy. The torso guide features Brilliantly colored pictures of each part of the torso, Even the smallest anatomical structures of the torso are explained. Valuable teaching tips to create more interesting lessons with your 3B Scientific® torso. Complete with 7 different languages (Latin, English, German, Spanish, Portuguese, French, Japanese).Also on a CD-ROM in pdf-format to assist in creating tests or preparing lessons with 3B Scientific® torso. Torso guide comes complete in a colored filing system.